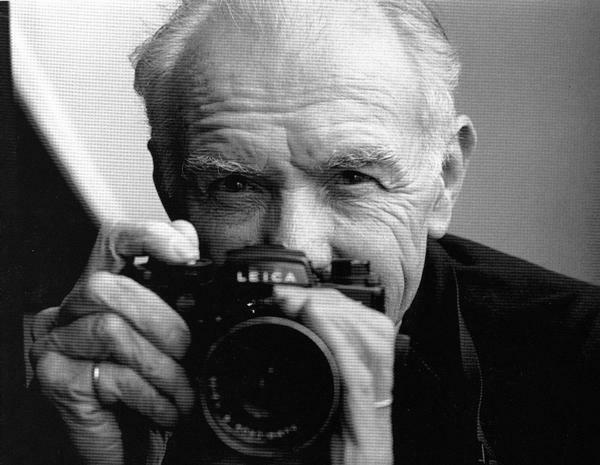 Robert Doisneau was born on April 14th, 1912 in Paris, France. Tragically, both of his parents died by the time he reached the age of seven and he was raised by his aunt. As a teenager, he took up photography, and his love for the art only grew as the years passed. He found work in advertising, and, for the early years of his career, that sustained him. As he got older, though, he transitioned into more artistic photography, recording the images and scenes that he thought the most moving. His trademark came to be his portrayal of everyday street life. The hustle and bustle of the city provided him with more than enough inspiration. In particular, he photographed the children of the city at play in there own world, away from parental supervision. His pictures of the streets of Paris helped immortalize the city, and many of his works also enhanced its image as the city of love. Doisneau was married to Pierrette Chaumaison until her death in 1993 and had two daughters with her, Annette and Francine. Doisneau died in 1994 shortly after his wife. In regard to his photography he said, "I don't photograph life as it is, but as I would like it to be." 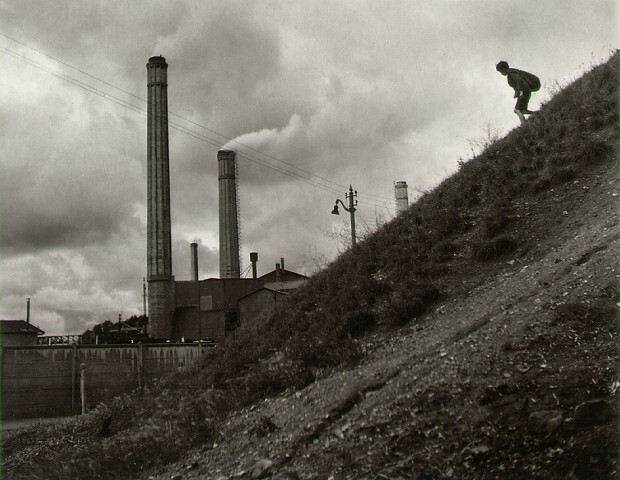 Dosiseau grew up in urban area of Southern Paris, and was not far away from factories such as this one. Like many before and after him, he lamented how these giant factories marred the landscape, and inhibited the natural beauty of the land. In this picture a man is also shown heading towards the factory, presumably for work. 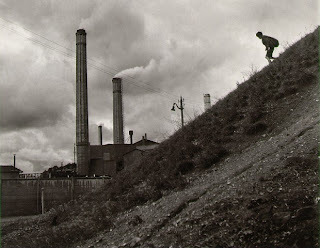 Factory working conditions being as bad as they were even by the 1950's, Doisneau gives a comprehensive and stark picture of a factory and all the connotations and mental images that come with the word. Doisneau's love for capturing the innocence of youth is on full display in this photo. 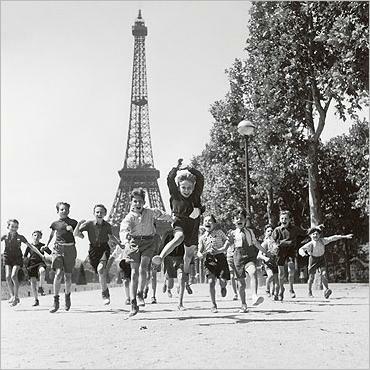 Children running about the Champs de Mars Gardens gave Doisneau an opportunity to capture a certain amount of authenticity as well. By showing them at play, he shows them as they truly are. They are acting without any restrictions, and no adults are close enough to curb their behavior. 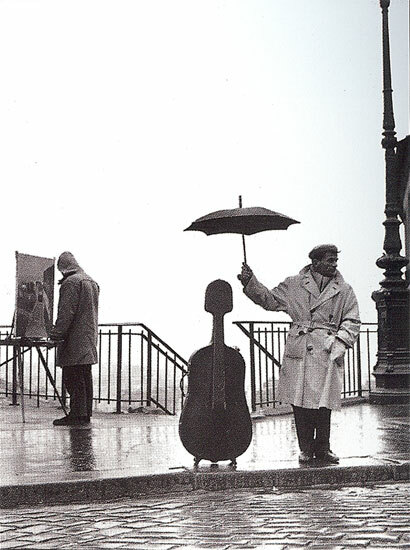 Musician in the rain is a great example of Doisneau's romanticization of Paris. An artist who goes on despite the rain and a musician giving cover to his instrument, exemplify the kind of artsy, idealistic way in which Paris is now seen. It has also, been said that Paris is most beautiful in the rain. So, Doisneau, no doubt, made a point to show the city in a moment of such condition. 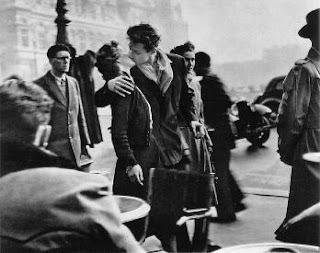 Kiss by the Hotel de Ville is most definitely Doisneau's most famous piece. It captures the young and impulsive love that Paris has come to symbolize. The spontaneous kiss in the middle of a crowded street, and total disregard that each lover has for anything but the other, shows a certain type of passionate love. The photograph also sparked great controversy, as a couple who thought they were photographed without their permission sued because French law stipulates that each individual holds the rights to their likeness. However, Doisneau revealed the photo was of another couple, whose permission he had received to take the picture, and to whom he had given an original signed copy of the photo. What about your subject is particularly French? Robert Doisneau's photography a played huge role in the immortalizing of Paris. His black and white images have furthered embedded France as the City of Love in our global culture. He romanticized Paris to a degree that perhaps no other city has been. Without him, who knows if the cultural implications that Paris stirs to mind would still be so widespread. It is not that he made Paris beautiful, it is just that he made sure everyone knew it was so. What are some major themes that your subject addresses? Doisneau focused largely on everyday street life and the common human interactions that take place constantly. He understood the beauty of human relations and the importance of capturing them. Nothing was as beautiful to him as the wonder of everyday life itself, and the simultaneous simplicity and complexity of it. He once said, "The marvels of daily life are so exciting; no movie director can arrange the unexpected you find in the street." How has your subject contributed to French culture? Doisneau greatly attributed to the artistic and romantic image that French culture as a whole possesses today. He changed the way all the generations after him would see and think of France's greatest city, and was a pioneer of photography in general. He gave the French a great flag to stick in the history of the art of the photography and left a truly indelible mark on France's culture.